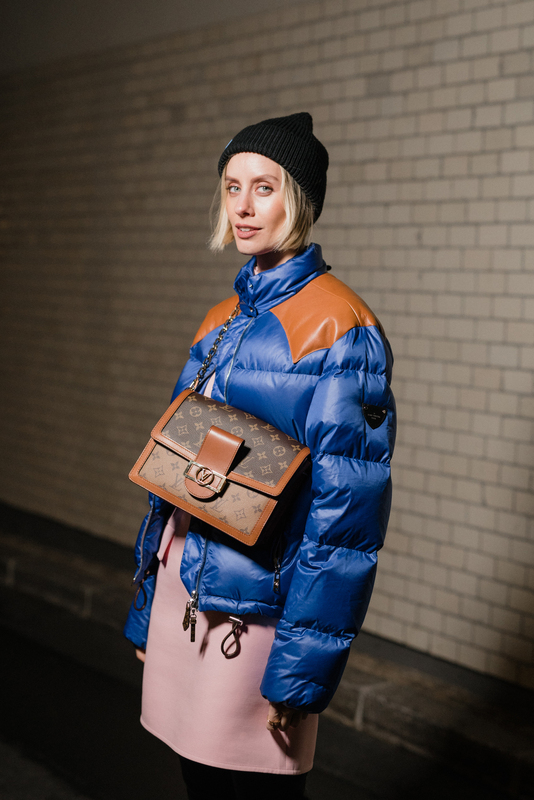 Anzeige/Ad: The freezing cold temperatures in Berlin were the perfect opportunity to wear my new colorful Louis Vuitton puffer jacket. We are all longing for some color on gray and rainy winter days. Check out the look I have created with my new jacket, because cold temperatures are here to stay. For your perfect winter wardrobe you definitely need to invest in a warm puffer jacket. I don’t need to tell you that puffer jackets are still a major trend this season. You see them everywhere. When trends are likely to stay and have already become widespread, I always try to find pieces that are outstanding, to set me apart from the crowd. I like to wear eye-catching pieces, yet always stay true to my style. Over the last seasons, puffer jackets have clearly lost their skiing and sportswear image and have turned into winter’s most-wanted everyday jacket. It is actually chic to be cozy and warm. However, the secret to keeping it chic while staying warm, is to find the right pieces for your total look. It’s all about the right styling. I like to choose very feminine or elegant pieces. This way you never look too sporty and casual. It’s the perfect way to maintain a balanced aesthetic. A sporty and feminine mashup is the key. Puffer jackets should no longer be associated with athleisure and skiing, they have turned into a proper fashion item and are a true winter staple. You can style your puffer jacket in many different ways, it is such a versatile piece and there are different fits and styles that work for everyone. As you all know, I am obsessed with the Louis Vuitton ready to wear collections. I recently found this beautiful blue down jacket and immediately fell in love with it. The bright blue color is a real eye-catcher and the perfect statement piece for gray and rainy days. It has a slightly oversized fit, an adjustable waist and a super high collar. It doesn’t only keep you warm but also makes you look super fashionable when you close the zipper completely up to the top. I’m obsessed with all the small details. The monogram canvas zipper makes the jacket really special and unique and emphasizes Louis Vuitton’s heritage work. I love the contrasting leather shoulder pads. Super exclusive and individual. I decided to pair my puffer jacket with a super feminine dress. As I mentioned above, contrasts are key when you want to pull off a cool puffer jacket look. To me, the candy color perfectly works with the bright blue. Pairing colors can either brake or make your outfit. Choosing the right contrasting colors will definitely excite and enhance your style. It might be an unlikely color combination. However, it’s perfect for me. I love to combine dresses with my futuristic over-the-knee sneakers, you already know from a previous blogpost here. The Archlight boots are a key piece of the new LV Cruise Collection 2019. I’m totally obsessed with their style and fit. 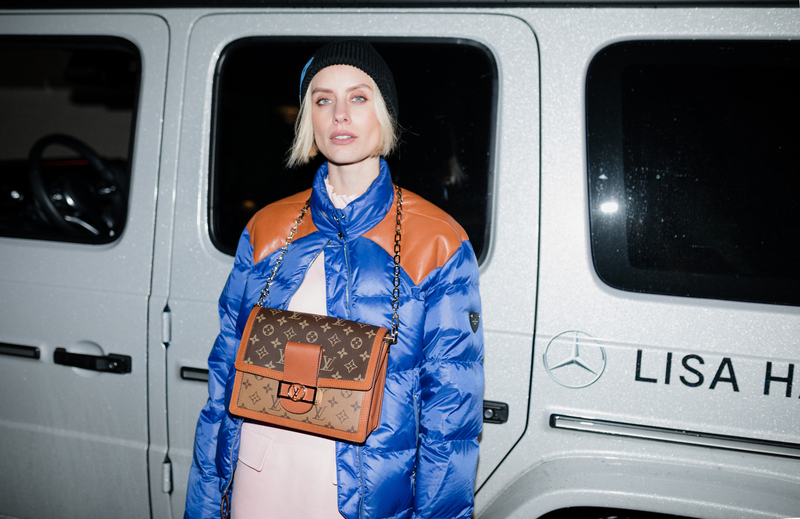 The LV monogram is alway a good idea, especially when it is part of the new Cruise Collection, too. I am so in love with the new Dauphine handbag. One bag, two Louis Vuitton monograms: the Monogram canvas and the Monogram Reverse canvas. It is such a modern take on the heritage Louis Vuitton handbags, featuring new elements such as a magnetised lock and a cool chain strap. What do you think? Doesn’t it perfectly match my leather shoulder pads?